These Moroccan, small ceramic pieces are handmade and glazed. 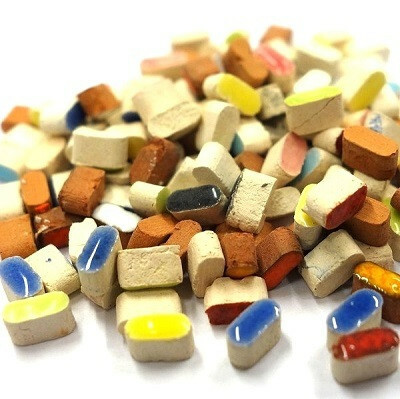 With these little pieces you can create precise figures to your mosaic works. With this material you can also make nice details to your doll house or make beautiful figures to greeting cards, etc. Length of a piece is 5 mm, width is 2 mm, thickness of a piece is 3 mm. 10 grams pack includes 190 pieces, covers about 6 x 6 cm area. You can also combine this material with micromosaic triangles and squares. Colors may vary slightly in different order batches. This material is not frost-resistant. We recommend to use tweezers, see.